Bring a large pot of water to a boil. Add 1 tablespoon salt and the pasta. Cook according to the package directions. Drain the pasta and then stir the frozen corn into the pasta to cool the pasta and defrost the corn. 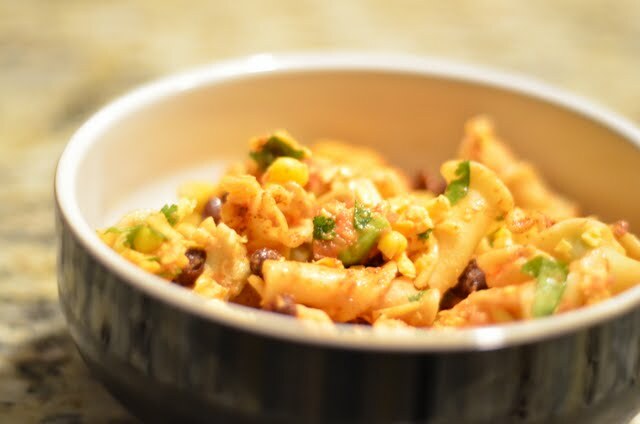 Stir the salsa into the pasta and corn, then add the beans, tomatoes, cilantro, and cheese. Combine lime juice and avocado in a small bowl, and stir to coat avocado. Remove the avocado from the lime juice and add to the pasta (if you’re serving that day otherwise keep it separate until ready to serve), reserving the lime juice. Heat a small stick pan (not non-stick) over medium heat for a few minutes , add the spices and stir just until they start to smoke, no longer than a minute to toast them. Add the spices, garlic, and ½ teaspoon salt to the lime juice, then slowly whisk in the oil. Mix dressing into salad. Serve immediately or chill for up to one day.